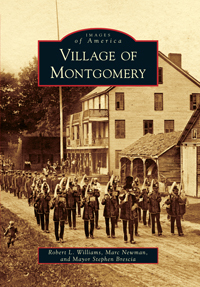 On May 31, 2008, the doors to the new Montgomery Village Museum officially opened with a special celebration. The driving force behind the museum is Village Historian Marion Wild. Marion worked very hard to find a place to show people all the artifact's she acquired over the years. Luckily she was able to procure Wesley Hall, built in 1828 as a Methodist Church, then turned into the Senior Center. Marion and many volunteers put in countless hours of work planning and moving the museum from it's previous location in Village Hall. Montgomery Village Museum will offer local residents the opportunity to learn about historic Montgomery life. Dispays have been assembled showcasing past businesses, school and churches, as well as other displays on local history.